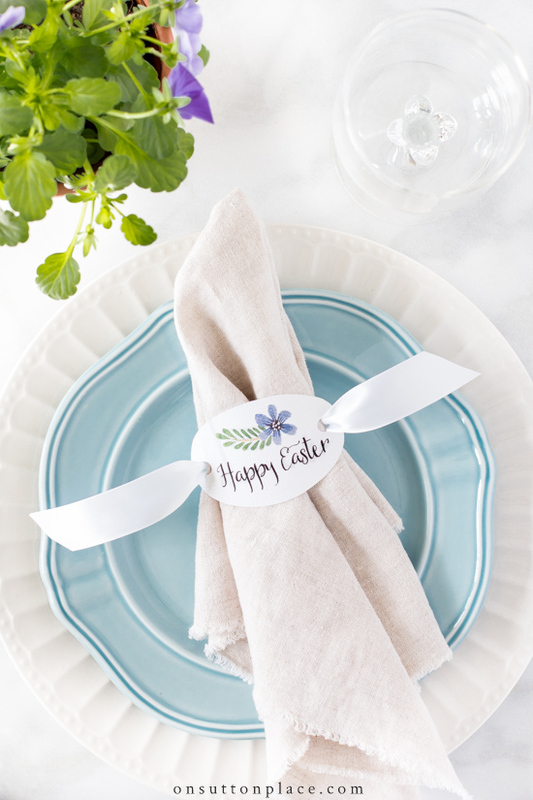 Free printable happy Easter napkin rings to add a custom touch to your Easter table. They can also be used as place cards or gift tags. I love it when readers make requests. Not only does it give me an inkling as to what you all really want, but it makes my creative juices flow. (This is a good thing because sometimes the juices are frozen solid.) 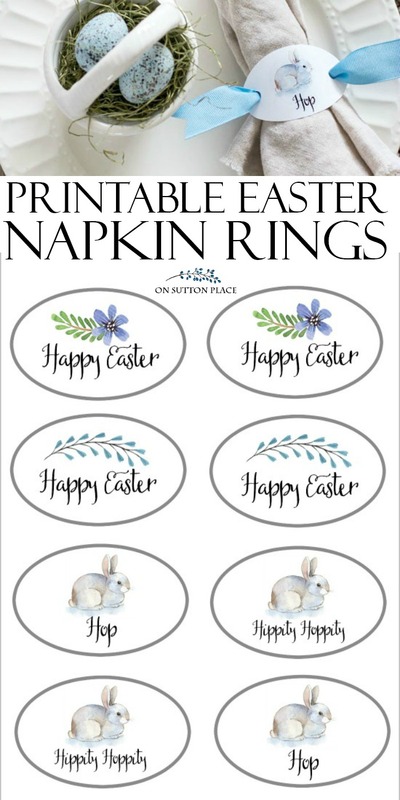 I’ve shared a couple of printable napkin rings for other holidays, so I’m not sure why the idea of an Easter one never occurred to me…but it didn’t. That is until a reader asked! 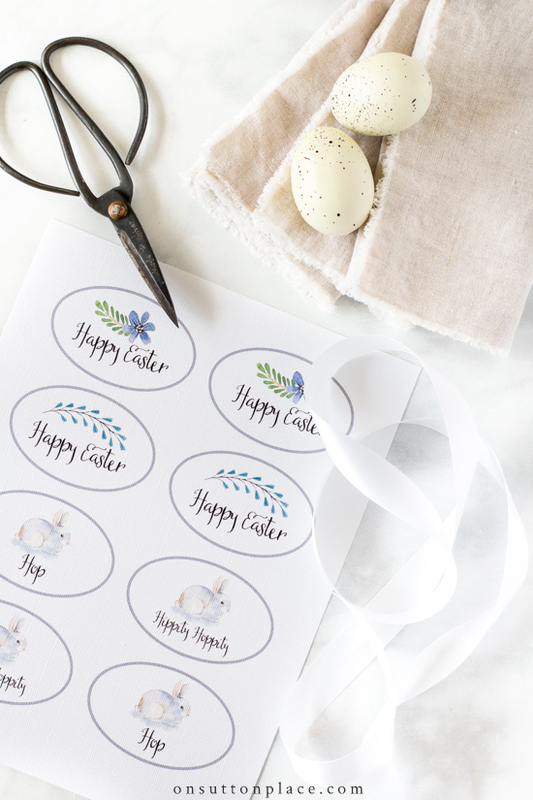 These printable Happy Easter Napkin Rings are so simple to make and the oval gives them a little extra interest. I also threw in a couple that say HOP and HIPPITY HOPPITY that would be perfect for kids. Print and cut out the tags on sturdy card stock. I cut inside the outline but if you want a border, cut outside the line. Punch holes in both sides of each oval. Cut lengths of ribbon about 10 inches long. Thread the ribbon through the back of the ovals and around the napkin. Our new hardwoods are being installed next week. This is the biggest renovation project I have ever attempted, and I’m more than a little nervous. I’ve hired carpenters to help with the finish work and one other very special project that I’ll share later. It’s something I’ve wanted to do for years and I decided it’s now or never. I’m not sure you’ll recognize the place when it’s all finished! *Update: the renovation is finished! Click [HERE] for all the details. You will also receive new blog posts, special offers and announcements, and instant access to the OSP Members Only Library. Please join us! Current OSP subscribers can download this file from the Members Only Library at any time. Darling Easter baskets next to the napkin. Would you share where you brought them? I plan on doing the napkin rings for Easter. Always looking for something new. Thank you for sharing. I found your site through Pinterest, love it! I printed these tags out for our Easter dinner and got many compliments, they are so pretty and added such a nice touch. I also realized that you could use them to put over the neck of a bottle, so I will use them next year for that if we are going somewhere and bringing wine to the host. :) Thank you for all of your ideas, I look forward to visiting your blog often! Thank you so much! These are so cute! Just joined and I love all the crafts and recipes. Thank you soooo much for accepting my request to join. Please keep up the fantastic work! i love printables, need some for mother daughter banquet. 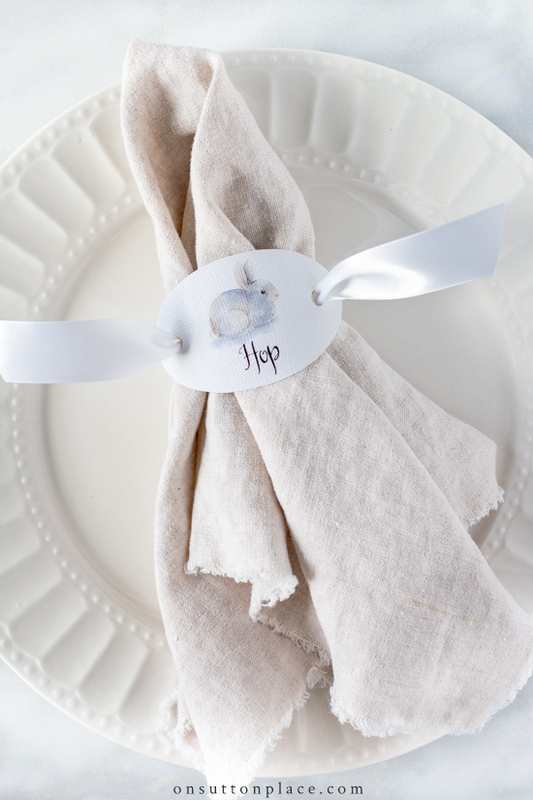 I love the Easter napkin ring printables. Thank you so much! How darn cute and such a simple idea. Pinning for later! Ann they are so so so cute I love them . Hope your renovating turns out exactly the way you want to be .. Thank You for sharing hope you have a wonderful stress free day…. Ann, such a cute idea! These napkin rings are lovely. Thanks for all your wonderful ideas! Have a blessed week-end! Good Luck with your flooring. It will be so nice when you are finished. Those Easter napkin rings are absolutely adorable and so festive! Thank you for sharing these. You are amazing! The napking rings are lovely. I have downloaded the printable and hope to use them next week when I am hosting a brunch for my Bible Study ladies. These are adorable! Thanks for share, Ann!! These are just so fun, thanks, Ann! Thank you Ann for the printable! Love these and can’t wait to make them for our Easter dinner!! These are the sweetest Easter napkin rings! Thank you so much for sharing them with us. I especially love the bunnies. I hope your floor installation goes well. I can’t wait to see the after pictures. Love the cardstock napkin rings. Great idea. Thank you once again for the printables; I LOVE PRINTABLES!!! Just bought a printer a couple months ago and I’m thoroughly enjoying it (mostly thanks to you Ann). I made the Valentine banner, your wonderful 2017 calendar, and just yesterday the herb markers. Today I’ve just gotta have these sweet little Easter ones; LOVE bunnies in any season; they’re one of my favorite animals. Thanks again Ann. Thanks, Ann. I am always looking for new and different ideas for Holiday seasons. This project should be fun and there are so many options and colors one can choose to accessorize. These are adorable! I love the simplicity of them and I love that with a printable you can do something different every year. Thanks for sharing the printable! Perfect napkin holders! It’s my turn to host East dinner and I love making a special table. There are going to look beautiful. Thank you so much. By the way, do I spy a Liberty Blue plate under that napkin? What a cute idea – thank you for creating and sharing them with us. I love your design work. Is the project a faux mantle? your hardwood floors, you will love them. These napkin rings are the cutest. I love them. The blue napkins are such a beautiful shade. Where did they come from? Paper crafting is my current hobby of choice, so I can’t wait to make these. These are adorable Ann. Thank you for sharing. Can’t wait to see your new makeover. Those are sooo cute! Thanks Ann! Thank you for the Easter printable tags and banner. I’ll be using both this Easter with a little embellishment of my own. I love little projects that can be shared with my grandchildren. You inspired me to try a neutral decor, which led to an Art Van shopping expedition, too. My husband, who usually only cares about the comfort of a sofa, was adamant about the color- as light as possible. He chose Desire Pearl fabric for our sofa and loveseat. We hope we like it as much as you do yours. Congratulations on the new hardwood floors! I teach Nutrition & Wellness to juniors and seniors, and we will definitely use these for our Easter meal. For Thanksgiving I gave some girls the task of wrapping our plastic flatware in large paper dinner napkins and then attaching the tag, ribbon, and rosemary sprigs. The girls loved their handiwork and the napkins/rings looked terrific. Thanks for the ideas and graphics. I love your site and all your ideas and the printables are amazing. I have a certain place I trade out the prints east season. I wait anxiously for your emails! Ann, these little Easter printables are the cutest. We have Easter at our daughter’s so I think I will print these for her table. She will love them! She is so busy with young teenagers and loves when I help her out! Thank you, Ann. HI Ann, thank you for the printable Easter Napkin Ring/Tag sheet! As always, you inspire me with your many lovely decorating ideas! Great idea,thank you so much. Tchank you so much. I’m doing it on Easter.